Hydraulic fracturing (fracking) and transportation of natural gas releases methane into the atmosphere and contributes to the problem of global warming. It is for these reasons that we call upon the Council of Grey County to enact a ban on hydraulic fracturing in Grey County, Ontario. We’ll be delivering this petition to Grey County Council in person in April 2015. A chat at the Sapphire Café and Lounge – 17 Macdonell St. – at 7:30 pm to discuss fracking, elections, and pipelines. Grab a coffee and expand your knowledge by sharing thoughts face to face, that quaint old-fashioned way of engaging in political discourse. This is a cellphone-free event. 1. Be respectful in tone. 4. Cell phones off. This means you. On Monday, October 6, the National Energy Board (NEB) released a letter temporarily denying Enbridge’s “Leave to Open” submission on Line 9 based on the inadequacy of the valve safety standards on the pipeline. The NEB is requiring that Enbridge install valves on both sides of all Major Water Crossings and other significant areas in order to “limit damage from accidental discharge” and provide “automatic blockage of the pipeline”. In light of all the recent information on fracking, it is apparent that we are hitting rock bottom (literally) in our quest for energy. Fracking is clearly unsafe and according to a recent EKOS poll done by the Council of Canadians, 70% of Canadians are opposed to it. There is a lack of scientific research on wells that might leak and the hundreds of chemicals that are used in the process. 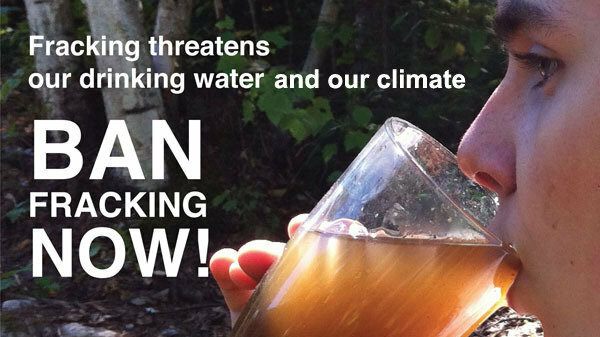 Why would we put our water, the most precious resource of humankind, to that kind of risk? Each gas well requires an average of 400 tanker trucks to carry water and supplies to and from the fracking site. There are up to 600 chemicals used in the process, some of them known carcinogens and toxins. The fracking sites leach methane gas and toxic chemicals out from the system and contaminate ground water. Water wells near fracking operations have methane concentrations 17 times higher than normal wells. The waste water from the fracking is left in open pits to evaporate, contaminating the air, soil and water. This affects eco-systems, watersheds, our lakes and rivers and our children. It does not seem to be worth the risk. In a time when we should be dramatically cutting back any kind of emissions that could advance the warming of the planet, this makes absolutely no sense. Say no to fracking! For 39 years, Daisy Turner has been a professor’s wife, typing his notes and helping out. The centerpiece of her life is a weekly community dinner she hosts—one that always features soup. And then, one day, her husband drops dead. Daisy has nothing to hold onto—except, perhaps, the soup. Then, suddenly, Daisy finds herself entangled with a man whose wife is disabled, mothering a young activist-farmer, and swept into the controversy about fracking that has begun to concern their small Ivy League town. Ithaca (October 1, 2014, Storywell, $14.99) explores what happens when a quiet, almost sedimentary life meets the high-pressure forces of small town life. How do you rebuild after life as you know it is suddenly turned upside down—or is fracked? On Saturday, October 11, 2014, beginning at 2:00 p.m. The South Niagara Chapter of the Council of Canadians marks the third annual GLOBAL FRACKDOWN day by inviting you to an information session on fracking. We’ll be screening Josh Fox’s award-winning documentary, GASLAND, followed by discussion and a presentation by Toban Black, co-editor of the newly published collection, A Line in the Tar Sands: Struggles for Environmental Justice.